Mobile phones and tablets are disguised as minicomputers. They allow you to do everything which you can do on your PC. For example, you can play Android Simulation Game, track your expenses, create notes, manage emails, and more. As people have switched to mobile devices for everyday tasks, they must use a powerful firewall app for securing their device. Firewalls allow users to block incoming connections. Hence, if you’ve connected your device to the internet, the hacker’s every attempt to gain access to your device will fail. Smart firewalls block malware and viruses. They let you configure rules to block URLs or domain names having a specific keyword. If you’re searching for a good Android Firewall application for your mobile phone or tablet, go through the following paragraphs. Home: Here, you’ll find two buttons i.e. start and stop. These two buttons allow you to establish a VPN connection on your mobile phone. Pending apps: In this section, the user will find a list of apps that the firewall has denied permission to transfer data over the internet. 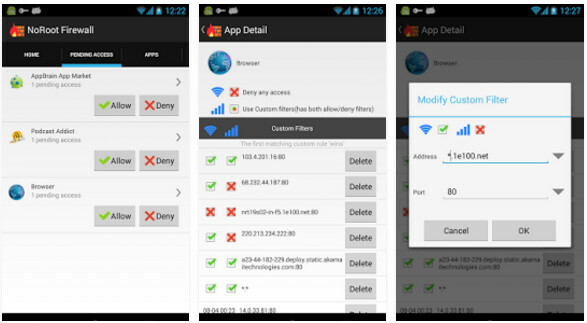 Apps: This tab allows users to allow or deny WiFi/data connection to apps you’ve installed. Filters: Here, you can set up advanced filters. While creating a filter, the app asks you to enter an address/domain name and a port number. Access log: You can check the firewall activity with the No Root Firewall App for Android. NRF doesn’t require root access. It’s a great app with a good interface and smart features. Allow WiFi or 3G/GPRS/4G connection access when the screen is off/on. Block network access when SIM is working on roaming mode. Support for metered WiFi, data connection. 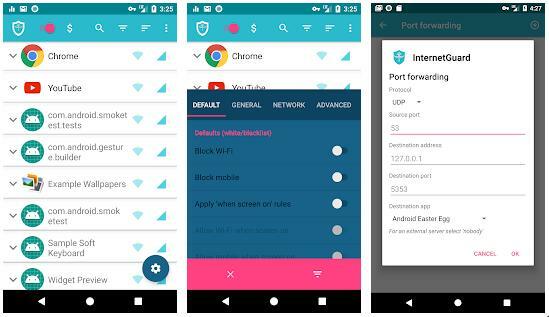 You can configure the NetGuard No Root Android firewall app to filter data packets going out of secure VPN channel. Below are the various options you’ll find in the Mobiwol app for Android. Firewall status: Here, users can turn on/off firewall module by tapping on the toggle button. Firewall Rule: Users can easily configure data transfer rules for individual apps through this interface. Logs: You can check the content of the log file generated by the incoming/outgoing IP packets in the logs section. Data usage: Mobiwol tracks your data usage when you enable its firewall feature. InterGuard is yet another top-rated Android Firewall App that works without prompting users to enable root access. It has 10000+ users. The app displays filters, search tool, menu icon, a list of apps and an option to show the app details on its main interface. This interface also features a toggle option to enable/disable the firewall. Besides the app name, you’ll see two icons. Users should tap the WiFi icon to prevent the app from using the WiFi connection. Similarly, if you don’t want the application to use mobile data, tap the mobile data icon. IG saves the firewall rules on the fly. Hence, the app won’t prompt users to apply or discard new rules when they quit the app. The app has a user-friendly interface. You can configure it to maintain the history of firewall rules you’ve set up and use dark theme instead of the light theme. InternetGuard supports subnet routing, tethering, etc. It can also access the local area network. You can use this feature only if your device is connected to LAN. IG provides an option to enable firewall rules for certain networks. It lets users import and export settings. Conclusion: A firewall app is must have application for phone and tablet users who don’t use an Antivirus. Install and configure the firewall once and forget about security issues. Apart from using a good firewall application, make sure that you use a good web browser such as Google Chrome. The browser from Google has the safe browsing feature that reports malicious URLs as soon as you try to open them. This is not accurate. DroidWall requires ROOT!